John Bardeen was born of May 23, 1908 in Madison, Wisconsin, the second son of the son of Charles Russell Bardeen, the dean of the University of Wisconsin medical school and Althea Harmer Bardeen. Brilliant at an early age his parents moved him from third grade to junior high. When Bardeen was 12 his mother became seriously ill with cancer, and although his father downplayed the seriousness of the illness to his children Althea Bardeen died. Bardeen seriously affected by the death of his mother barely passed French that year. Despite the set back Bardeen graduated high school in 1923 and that fall entered the University of Wisconsin, to major in electrical engineering, at the age of 15. Bardeen graduated with a B.S. in electrical engineering in 1928, after taking a semester off to work at the Western Electric Company in Chicago. Having already completed some of the coursework Bardeen stayed on at the University of Wisconsin to earn a M.S. in electrical engineering studying the emerging field of electrically prospecting for oil under Leo J. Peters. He chose to stay in electrical engineering because it had the math that he loved but unlike physics there were better job prospects and because he did not want to become an academic like his father. By the time he graduated the depression had struck and job prospects were scarce. After being rejected by Bell Labs, Bardeen was able to get a job at Gulf Research Laboratories again working under Peters developing ways to study magnetic and gravitational surveys to find oil. Geology did not really interest Bardeen and after three years he applied and was accepted to the graduate program in mathematics at Princeton University starting in 1933. At Princeton Bardeen studied both physics and mathematics, completing a thesis on solid state physics under Nobel Laureate Eugene Wigner. Before completing his thesis Bardeen was accepted as junior fellow of the Society of Fellows at Harvard University. Bardeen spent three years at Harvard working on problems cohesion and electrical conduction in metals and he also did some work on level density of nuclei. Bardeen graduated with a Ph.D. in mathematical physics from Princeton in 1936. In 1938 Bardeen accepted a position as an assistant professor at the University of Minnesota. In 1941, with America involved in WWII, Bardeen worked as a civilian physicist at the Naval Ordinance Laboratories helping the Navy develop ways for ships and submarines to avoid magnetic mines and torpedoes. He was offered a position working for the Manhattan Project, but refused. Bardeen had met William Shockley while he was at Harvard. After the war Shockley offered Bardeen a position in his research group at Bell Labs at twice the salary of his professorship in Minnesota. Bardeen joined Shockley and Walter Brattain working on an solid state alternative to the vacuum tube amplifiers that were used in electronic devices. In the spring of 1947 Shockley assigned Bardeen and Brattain the task of determining why the silicon amplifier (which was later changed to germanium) he had designed was not working. Drawing on his training in quantum mechanics Bardeen realized that electrons behaved differently at the germanium surface than in the interior. If they could control what was happening on the surface it would allow them to control the current. It took until the end of 1947 for them to perfect their device which was the first point-contact transistor. A transistor is a semiconductor device used to amplify and switch electronic currents. A transistor changes the amount of power in an electric current. Transistors are ubiquitous in modern electronic devices. Shockley seeing the potential of the new devices continued working on them, excluding Bardeen from further research. 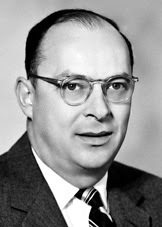 Bardeen, upset that he was not able to continue his research, left Bell Labs for a professorship at the University of Illinois. Bardeen, Brattain, and Shockley were awarded the Nobel Prize in 1956 "for their researches in semiconductors and their discovery of the transistor effect". Bardeen was making breakfast when he heard the news of the Nobel Prize win on the radio and he dropped a frying pan he was using spreading eggs across the kitchen floor. Bardeen brought only three of his five children (two of his sons were in school at Harvard) to the Nobel Prize ceremony, and when scolded by King Gustav, he assured the king he would bring them all the next time. At the University of Illinois Bardeen was happy because now he could research whatever he wanted. At Illinois Bardeen studied superconductivity, the ability of some materials (usually at very low temperatures) to conduct electrons without resistance. Working with Leon Cooper and graduate student John Robert Schrieffer he developed a theory of superconductivity called BCS theory (an acronym for their last names). BCS theory proposes that at low temperatures electrons condense into Cooper pairs which have some of the properties of bosons through interaction with the crystal lattice. As a single electron travels through a lattice it creates a small positive charge in the material through which it travels, which attracts a second electron. If the attraction between these two electrons is greater than the vibrational energy of the lattice, forcing them apart, they remain paired. Because the vibrational energy is proportional to temperature this explains why low temperatures are required for superconductivity. So the first electron pulls the second electron through the lattice creating superconductivity. Bardeen, Cooper and Schrieffer were awarded the Nobel Prize for physics in 1972 for their work on superconductivity. Bardeen was the first person to win two Nobel Prizes in the same field and he brought all of his children to the second ceremony. Bardeen died on January 30, 1991.